Most people near my age bracket know well the words above to the song “Yesterday,” penned by Paul McCartney and John Lennon. I remember well these pagan lyrics from my pre-Christian days. They came to mind recently as I researched some Bible prophecy verses that specifically mentioned that the Rapture would come “suddenly,” without warning. Were John Lennon’s Words Prophetic? Think how the world will be absolutely dumbfounded by the sudden dramatic change when the Rapture happens–-most will go from comfy surroundings to unimaginable horror—in a split second. Normal and routine suddenly change to sheer panic and total confusion. In all probability, due to the electromagnetic polarity of the earth being temporarily disrupted, electricity will cease to work. This means cars and phones won’t work, planes will fall from the sky and communication will be limited, at least for a while, to how far you can holler or walk. So many things taken for granted, like food and water, will suddenly no longer be easily obtainable—even if you have money, gold, or silver. The scale of disruption is unimaginable. And it all begins suddenly when most least expect it. When you first read that verse, unless you’re a Greek scholar, it sounds like John is saying the events he’s about to describe will begin soon. This is an obvious problem since it’s been some 2000 years since it was written. Obviously the NLT should not be used as a study Bible as it’s a paraphrase, not a word-for-word translation. Trust me, for a Bible, you want to know what God said, not what someone thinks He said. So a word-for-word translation is always preferred when studying God’s Word, like the KJV, NKJV, or NASB. So the Bible clearly teaches us that the end of the Church Age comes suddenly, without warning to the world. Do you think if the Rapture were to happen this year it would suddenly catch most of the world off guard? Oh wow would it! Imagine a hungry, Holy Spirit-less world, dealing with the food distribution problems in Rev. 6:6. Not good. So just how bad are the post-Rapture events? I wince when I hear mid-trib Bible teachers trying to explain that Christians are only exempted from the “Wrath of God” and claim that Wrath only comes in the second half of the Tribulation. That has to be one of the dumbest arguments of all time. That last 1/3 of the world dying is in addition to those dying in Rev. 6:8—so a total of 50% of the world’s population dies! There are 7 billion people on the planet today. 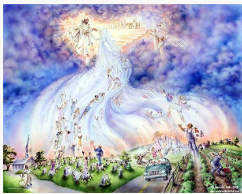 Assuming Rapture takes out one billion (probably a generously high estimate), then an astonishing 3 billion people will die in the first 3 1/2 years of the Tribulation. Yet, it does get worse in the second 3 1/2 year period. The Bible says God’s Bowls of Wrath are then poured out with such unbelievable destruction that it ends with an earthquake so large that the mountains around the world fall flat and the islands disappear! That’s unimaginable! So to say the first 3 1/2 years of the Tribulation aren’t that bad is ludicrous. And all of this comes suddenly, without warning, for most people on the planet. But, believe it or not, there’s one essential characteristic of the first 3 1/2 years of Tribulation in which you could be directly involved. There’s something you could do today that might affect those living into the Tribulation. Interested? Read on…. Here are the facts: There will be millions upon millions who’ll get saved after the Rapture and during the Tribulation. There are scores of references to Jesus and the Gospel in the Tribulation. It’s a pretty simple choice: Choose Jesus and probably die on the earth but live forever in heaven. Or choose Satan and live on the earth but eventually be cast into hell forever. MULTITUDES will choose Jesus. There are so many people who get saved during that time that the Bible says they’re uncountable! No doubt, of all these getting saved in the Tribulation, many will have had knowledge of Jesus before the Rapture but never believed the Gospel. There’ll be people who missed the Rapture who will immediately KNOW WHY THEY MISSED IT. They’ll get saved by faith during the Tribulation and become bold warriors for the truth. These have a second chance to believe the Gospel, much like many who got saved at the last second when Noah’s flood waters began rising. They immediately knew they were wrong not to listen to Noah’s warnings. So they called out to the Lord before they drowned, much like the thief on the cross. Those saved will not believe the monstrous lie being perpetrated about what happened to all those disappearing people at the Rapture. They heard about the possibility of Rapture but didn’t believe at the time. And when the Rapture happened, they became Believers and will be great witnesses for the truth. It’ll be a terrible time, but these saved-by-faith Tribulation Christians will be saved from eternal punishment in hell, even though they will endure temporary pain and/or death during the Tribulation. When the New World Leader first shows up, he’ll explain away the Rapture with a bold lie. Those who believe this unspecified lie do not get saved. But the Tribulation Christians don’t believe the World Leader’s lie. They won’t have the Holy Spirit indwelling them but they’ll be motivated to “Live for Jesus” and “die for gain.” We wrote an article detailing the mass evangelism during the first 3 1/2 years of Tribulation. You can read it HERE. So discerning Christians, like you, can see when Rapture’s getting close. I’m convinced that regardless of the year, the Rapture will happen on Rosh Hashanah, the Jewish Feast that is celebrated in the fall each year (September 9-11 this year—begins at sunset in Israel)(1). And there are a LOT of Christians thinking this could very well be the year. Is there reason to think the Rapture MIGHT happen this year? Yes, because it’s been 70 years since Israel became a nation. 70 is God’s number for completion. It’s interesting, if nothing else. I am NOT predicting Rapture will happen this September. In fact, it probably will not happen this year—but it certainly could. And if it did, it’s all over for Believer’s human existence on this planet. We’ll get our new bodies like Jesus received after His resurrection (Phil. 3:20-21). But everyone left behind is in a real mess. So I would like to leave a few messages of instruction—just in case! 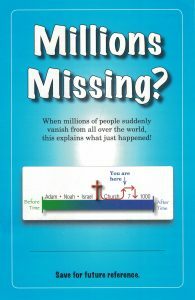 We would like to mail out a sizable number of our “Millions Missing?” booklets this August. This is our booklet of instructions for those who miss the Rapture. If you’ve never seen this unique booklet, CLICK HERE to view it. The idea is simple. We’ll pick random secular addresses in each state to mail to (and maybe a few liberal churches), as well as English-speaking addresses in countries like Australia, Great Britain, Israel, India, Granada, and South Africa. We’ll mail all these in early August to arrive no later than the first week in September, before Rosh Hashanah begins. If the Rapture happens this year, we’ll have left behind a lot of instructions for those “on the ground” worldwide. Just one of those instruction booklets could be used by God to keep someone from believing the “lie.” And maybe be used to reach many others. For every $100 we receive, we can mail about 200 booklets in the United States. Foreign mailing costs are about three times higher (no bulk mail rates, overseas distance, etc.). So about 100 can be mailed for $150. This is at, or below, our costs to make this mailing happen. But you could leave a message that may mean eternal life to someone if this is the year of the Church’s exit. You can donate any amount and we’ll add all the donations together and we’ll let you know how much we raised and how many we sent out. 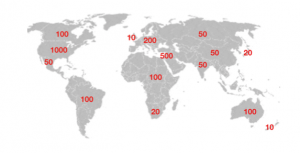 Below is a map of the minimum worldwide distribution we wish to reach with this August mailing. As I said, and don’t miss this fact, the Rapture is probably NOT going to happen this year. And we’re not date-setting. In all probability we could be mailing some again next year. And the next. So we can’t go crazy and empty the coffers. But with all that’s going on around us, it seems better to be proactive and leave a little truth on the ground around the world, just in case it suddenly happens. And if it does, it could be a life-saver for a lot of those left behind! Please note that scripture with bold and/or underline is added for emphasis.